An open house is one of the oldest and easiest ways to meet prospective homebuyers and home sellers. In theory, all you do is throw a few yard signs around the neighborhood, unlock the door, and the buyers and sellers come flocking in like people to a giveaway. But, the truth is that it isn’t quite so easy, is it? On weekends during the summer, folks have summer on the brain — vacation, trips to the beach, and bike rides. Unfortunately, your next open house may not be on their minds. Have you ever held an open house and been the only one there? Have you ever sat for three hours until your tablet and phone ran out of power and no buyers or sellers walk in the door? Put out lots and lots of directional signs. Top producing Arizona agent Brett Tanner recommends that each open house be advertised with 20 directional signs. Tanner suggests that you print a map of the area surrounding your open house and then mark where all of the signs are to be placed. The more signs you have out and about in the neighborhood, the easier it will be to attract the public’s attention. Invite the neighbors and your sphere of influence. Print out and deliver fliers to the neighbors a few days prior to the open house. Walk the neighborhood to drop off your invitations and mention that the owners are interested in inviting them to the open house. You can also invite members of your sphere through email, phone, social media and automatic dialing. Nowadays, most homebuyers are turning to the Internet before they walk out the door. Make sure that your open house is advertised on Craigslist, Facebook, your MLS (if applicable) and the local newspaper’s online portal in order to assure maximum exposure for the property. If there is a big game that day, turn on the television. This will engage the sports fans while the other attendees tour the home. When the television is turned on, visitors may stay longer, providing you with additional opportunities to engage them on the topic of real estate (and sports). While this may sound like a costly suggestion, it’s not. If the home has a nice backyard with a barbecue, you can showcase the yard by hosting a backyard barbecue, complete with hot dogs, lemonade and ice cream bars. It’s an enticing way to get prospective buyers into the home for more than just five minutes. 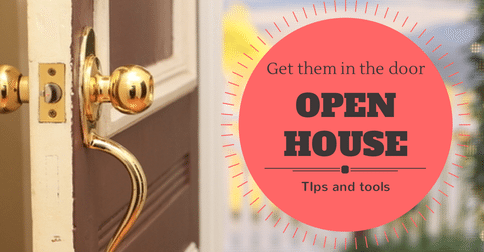 What you do to prepare for your open house and how you handle the traffic there is vital to the future of your business. Not only will your signs around town provide top-of-mind awareness, but the entire open house extravaganza is a live demonstration of the quality of the services you provide. Buyers and sellers may not purchase the home that is held open, but they may be so impressed that they hire you to help them sell or buy their next property. Even if very few people come in the door of your open house, always remember that each and every open house you hold is an interview for your next listing.